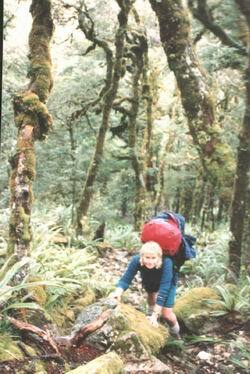 Most trampers walk The Wangapeka Track from East to West. This is by far the easier way to tackle the track. There are a number of Transport operators that run services from Nelson to the start of the track at Rolling River. Nelson Lakes Shuttles being one of them. 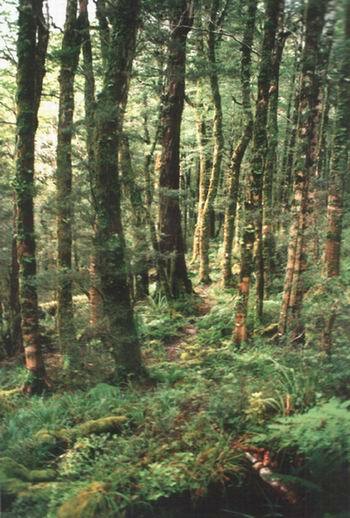 Also the same applies to the Karamea end of the track. Unfortunetly it’s not advisable to leave your own car at either end of the track because of vandals. Another option is to get friends or family to drop you off or pick you up. This section is easy walking with plenty of time to swim in the Wangapeka River.The old Kiwi Log Cabin is worth a visit and is still comfortable to sleep in. 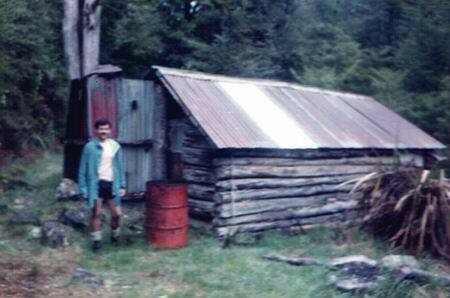 They don't make good old huts like these any more. I miss the funny cartoon signs that Ross Curtis installed along this section. For some insane reason they were removed when he resigned as the Park Ranger. 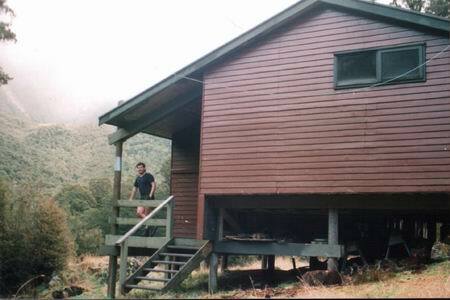 Kings Creek Hut is large and has two sleeping quarters. I must say it's not one of my favourite huts as it has no character and is often dark and damp. Cecil Kings old Hut is only 5 minutes up the track and you can still feel his presence in the hut. Another easy stroll up to Stone Hut.The Wangapeka River branchs just above Cecil Kings Hut where there's a old sign which is self explanatory about the South Branch Wangapeka. (see photo above). 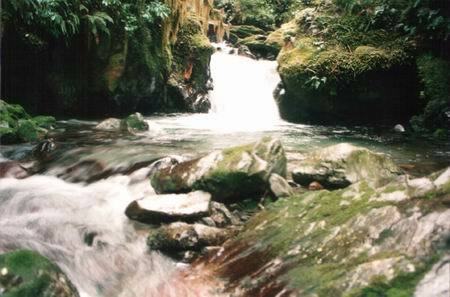 As you travel up the North Branch Wangapeka check out the rapids & pools below the track. There are still a few Blue Ducks about. There are a couple of good day trips from Stone Hut. 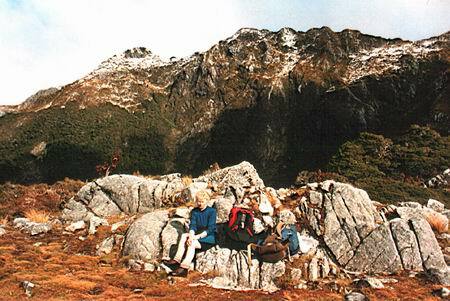 Nugget Knob, Biggs Tops or Mt Luna offer wonderful views. 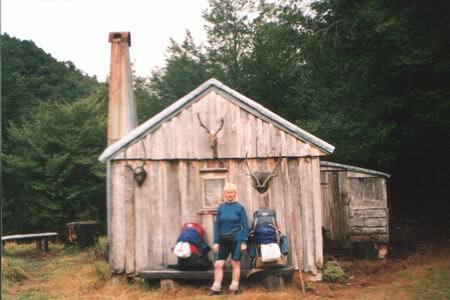 I've done a couple of good alternative trips from this hut. Hurricane Hut in the Matiri Valley is one long day from here. Half way along the ridge there's a good Tarn to camp if you want to break the trip. 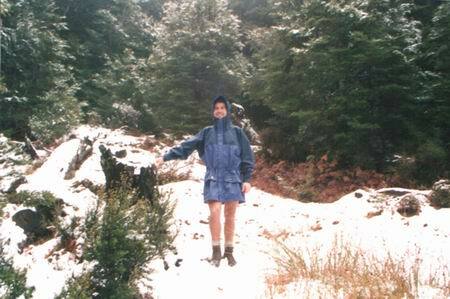 Another trip is to climb Mt Luna and walk along the ridge to Kiwi Saddle Hut and either drop down to the Wangapeka Track or spend a couple of more days continuing along to John Reid Hut.Then drop down Chummies Track and back onto the road. 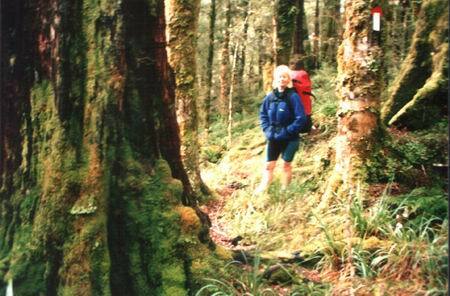 After leaving the hut you cross a huge slip from the 1929 earthquake and climb up to the Wangapeka saddleThe saddle is not high and you are still below the tree line. 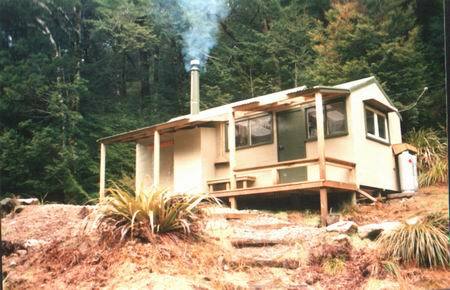 The rest of the trip to Helicopter hut is a down hill stroll crossing the as yet small Karamea River three times. There's a flood track for the last two crossings if the river is in flood. Helicopter Hut is well insulated and has a really efficient wood burner. 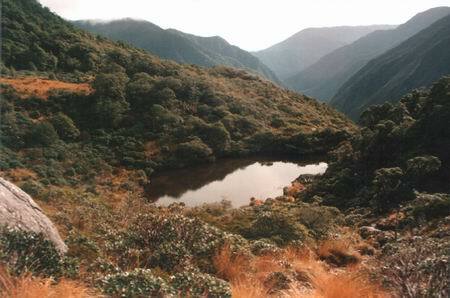 From the hut it's a easy climb to Broughs Tabernacle ruins where you get some good views down the Karamea Valley. The track drops steeply down to the Taipo Swing bridge and follows the Taipo River through some nice forest walking to Taipo Hut. An alternative is route is via the “Lost Valley” This will add at least 2-3 hours to your trip to Taipo Hut or you may wish to stay a night at the new Trevor Carter Hut. The Lost Valley certainly lives up to it's name with the small tarns and moss hanging off the trees. You expect a dinosaur to appear out of the mist. 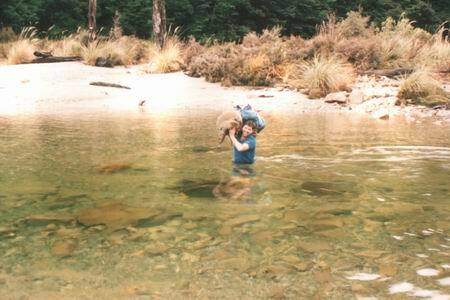 Remember you must cross the Karamea river which is knee deep in normal conditions. 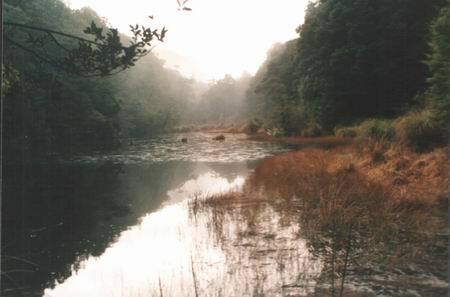 You can either return to the main track via Saxon Falls Track or continue up the Karamea track past the old Trevor Carter Hut site to join the track at the Taipo Swing Bridge. 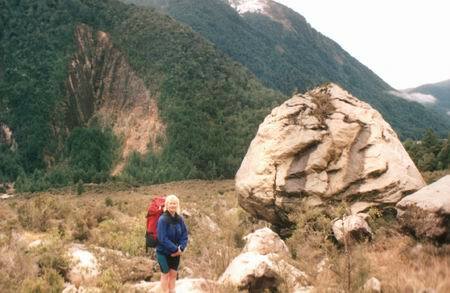 You get to see the raw damage caused by the 1929 Murchison earthquake and it's a bit disconcerning passing huge rocks(see photo below) some big as a house laying in the valley. Dislodged off the mountains in the big shake.We experienced a large earthquake while staying at the old Trevor Carter Hut. About 3.00am there was a large roar as a rock slide peeled off one of the ridges above us. We both lay in our bunks thinking this is the end. But lucky for us it came down some where else in the valley. 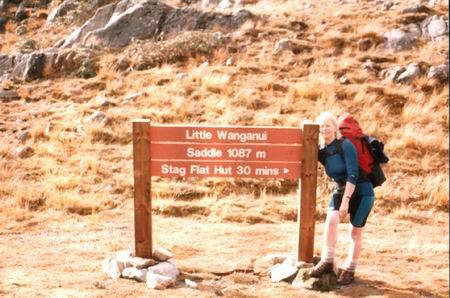 Taipo Hut is well situated for the climb up to Little Wanganui Saddle. It's a long day to Bell Town Hut and you should leave the Taipo Hut early. From the hut it's a steady 1 hours climb to Stag Flat. 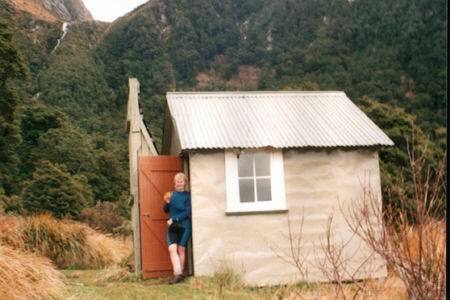 It's worth the extra 10 minutes to call into Stag Flat Hut for a look and a cuppa. The hut is still comfortable enough to spend a night (sleeps four). It's a steep 1 hours grunt up to the saddle from Stag Flat. But the views at the top make you forget the huffing and puffing and on a fine day another good spot for a cuppa. 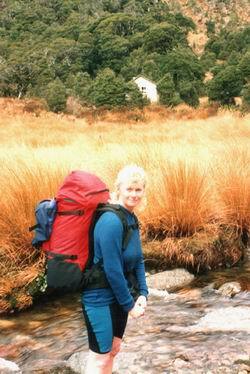 The look on Trish's face in the photo below best describes the steep climb up the saddle. 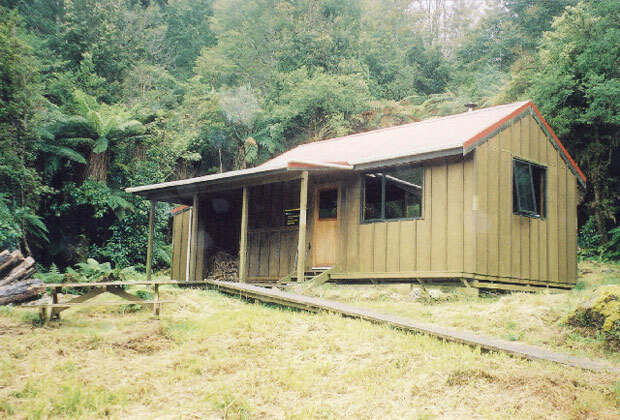 Stag Flat Hut has been rebuilt. But had no fireplace. 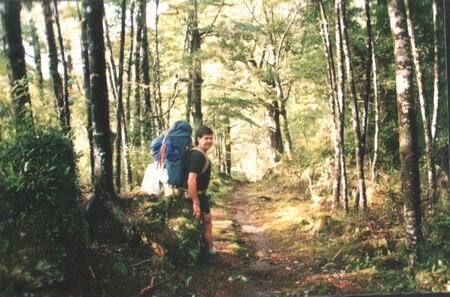 After passing the Saddle Lakes it's all down hill to Belltown Hut. The track although easy to follow is badly maintained compared to the Nelson side. Probably due to funding and the high rainfall on the West Coast side. 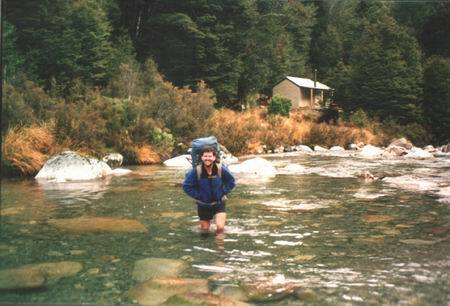 *Tangent Creek can be a bit off a challange to get across in heavy rain. We only just managed to get across and in reflection we should've camped the night as we had also ran out of daylight. 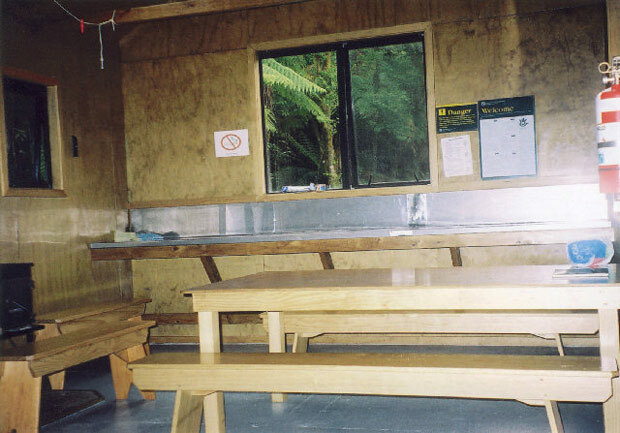 (Another good reason to leave Taipo Hut early).We had a rest day at the beautiful Little Wanganui Hut. 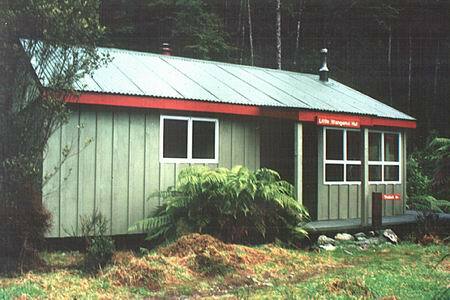 This is one of our favourite huts.We made fresh piklets with rasberry jam. This is something we do on the last night of all our trips and always carry two fresh eggs for this purpose.I must add that we've never broken any eggs in our packs as yet. We couldn't believe that the Little Wanganui Hut and the swingbridge were washed away in a huge flood the following year. 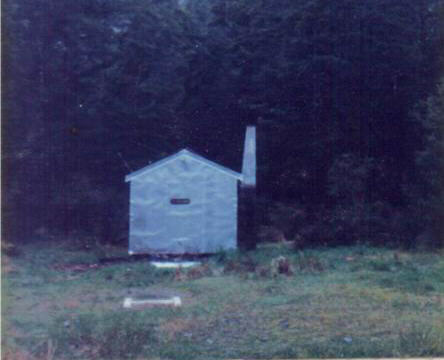 DOC have since built a new hut (Belltown Hut) on the old Belltown Hut site. Which is just across the river from the little Wanganui Hut site and of course on the same side of the river as the main track. 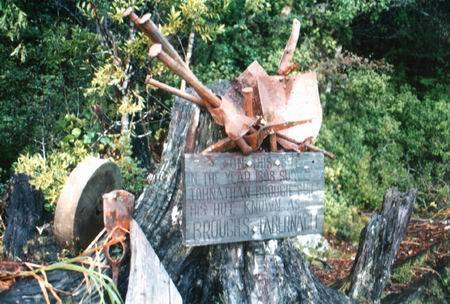 Maybe the old timers were trying to tell us something when they chose the hut site. Both the Little Wanganui Hut and Bridge in the above photos were washed away in a large flood. 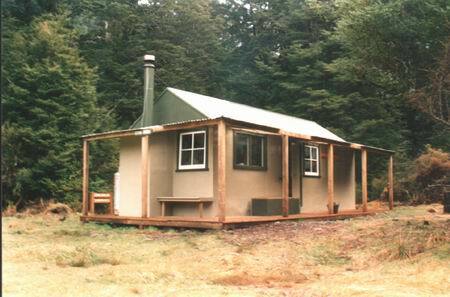 Doc have since built a new hut (Belltown) on the true right of the Little Wanganui River. 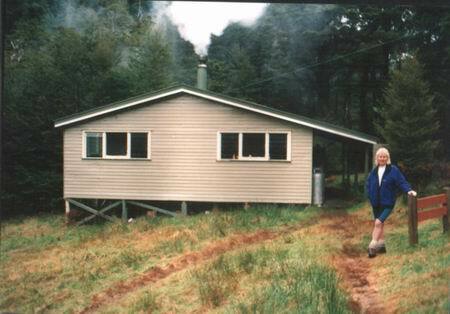 (photos below) to replace the Little Wanganui Hut. 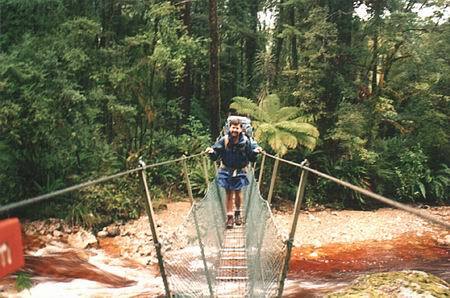 It's a easy tramp down the Little Wanganui River flats in normal with a number of river crossings river flows. If the river happens to be in flood stay on the true and pick up the flood track which adds a couple of hours to your time. I've been forced to use the flood track a few times and although there's a bit of long road walk.The mature forests make it a nice alternative to the river bed. There is a phone at the road end but at times can be out of order because of vandals. I have walked the road to the Little Wanganui Hotel (about 2 hours). Something that I wouldn't recommend doing. As it's a long hard lonely road. So you are best to arrange for Nelson Lake Shuttles or friends to pick you up. 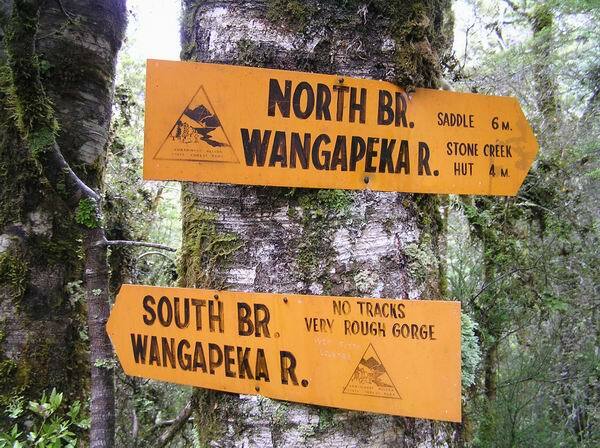 DOC have marked a track down the true right of the Wangapeka River. Removing the need to cross the Wangapeka when it's in flood.